For those who want more than the usual four-cylinder power, the BMW X3 M40i has the solution: a turbo six-cylinder engine. WASHINGTON — Driving a compact luxury crossover usually means nice transportation that has some power, but not really enough to get you in real trouble. But for those who want more than the usual four-cylinder power in the class, BMW has a solution. How about a turbo six-cylinder engine? For the good of all, I decided I should put it to the test and spent a week with the redesigned BMW X3 M40i. It has a starting price of around $54,000 — about $11,000 more than the X3 with four-cylinder power. But for that extra money, you get a very different vehicle thanks to that letter “M” in the name; it should say sport-tuned. The BMW has a specially tuned suspension so you can take corners quicker than you would usually dare with a taller crossover. The ride is more firm than the regular X3, but still good on our roads without beating you up over the bumps. The steering feels nice through the wheel and gets heavier as the speed builds, but feels light at slow speeds and easy for parking. Power is strong for this compact Ute; 355 horsepower makes this X3 a very quick ride. The in-line six has a nice, if muted, sound and there really isn’t any turbo lag. AWD is standard, so there is always grip. Upgraded brakes are part of the package when you choose the X40i and they do a great job of scrubbing speed. Fuel economy isn’t stellar, but I managed 24 mpg of premium for my week of driving, a little better than the 23 mpg on the sticker. The BMW X3 M40i has a sportier look, too. A special aerodynamic body kit sets the M40i apart from other X3 models. That body kit adds an aggressive front fascia with large kidney grills and air inlets under the turn signals. My tester had larger 20-inch wheels that add a nice look for just $950 and it shows off the blue brake calipers. Be careful with curbs — those cool-looking wheels seem very easy to damage. Trim pieces come in a muted Cerium gray, not something bright like chrome. Even the back side has blacked out exhaust tips. The redesigned X3 looks bigger than before and more like the larger X5; not a bad look at all. The new X3 is more rounded, with the body showing more lines and interesting shapes than before. I’m a fan of blue, and this Phytonic Blue Metallic is just the shade for me; a $550 option on the BMW. Most colors are available at an extra cost, except for white. The inside of the X3 has also been upgraded and is larger than before. That extra space is a perk for those up front or sitting in the back seat. The optional cognac Vernasca leather is a classy color that works really well with the blue exterior. The splash of color is a welcome departure from the usual stark single color interior. The materials seem on par with the competition, as well. The seats have a lot of power with manual adjustments, and are very comfortable and supportive. Even the back seats have nice comfort. The tester had heated rear seats, as well. If you choose the spend the extra $3,050, the Premium Package also includes a heated steering wheel, Head-up Display and NAV that works with a central IDrive control or voice commands. I drove a 2018 model with the $300 option of Apple CarPlay compatibility; there’s no Android Auto available. CarPlay is wireless, so no auxiliary cord is needed. Storage seems good, especially with the rear seats folded flat providing about 62 cubic feet; the lift up is pretty high for a compact Ute. 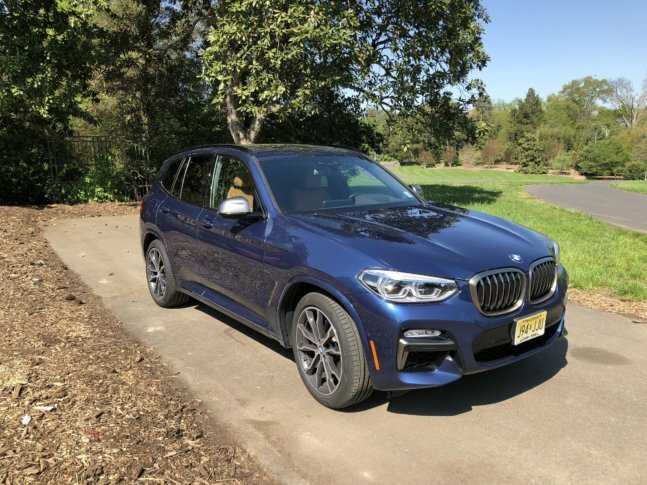 BMW calls their crossovers Sport Activity Vehicles, and the X3 M40i really emphasizes “sport.” With a powerful turbo six-cylinder engine and carlike handling, you might forget this is also a family ride. Now with more space and improved technology, the new X3 combines luxury with a fun-to-drive package.